The true beauty of having a car lies in having it answer when you call! You certainly wouldn’t want your car to go dying on you on the highway, on the way to your daughter’s graduation, would you? This is why an OBD2 scan tool is a very important piece of tech to have – trust me, it can be a real, life saver. Funny thing is – your vehicle must have actually been trying warning you before then. This warning comes in the form of the Malfunction Indicator Light (MIL) a.k.a., “check engine” light. The frustrating thing about this light though, is the fact that it doesn’t actually tell you exactly what is wrong with your car… and so the uncertainty continues! The solution? Simple – OBD2 scanners! With the right scan tool, you can find out exactly what is wrong with your car at any particular moment and fix it. Think of the scanner as a physician that specializes in diagnosing car diseases. OK, now that you know you need a scanner, the next question is how do you get the right one, right? Well, that depends on a lot of things, but most importantly, how much you’re willing to spend. Just like everything else in life, there are different types of scan tools – ranging from the basic code readers, to those that read and interpret the codes, to the more advanced professional equipment. Basic Code Readers: Just like the name suggests, these devices just read the Diagnostic Trouble codes (DTC), when you plug them into the relevant port in your vehicle. These devices only read the “trouble” and present the standard code that represents that particular issue, but it will not tell you what that code means. If you want to find out, then you’ll have to check it out online. This type is more common in auto shops and they’re usually the cheapest scanners. DIY Scanners: The do-it-yourself (DIY) scanners are a tad more advanced than the basic code readers. They read the DTC and tell you what it means. This is particularly good if you’re looking to carry out self-repairs. It pinpoints where the problem is and offers recommendation as to the necessary fix to be applied. These scanners can also connect to your mobile device or PC for easy data access. Professional Scanners: These are the ones you find in car manufacturing plants and advanced repair spots. They usually come as a tablet-sized equipment, that tells you absolutely everything that is wrong with your vehicle with a single scan. As expected, these are the most expensive ones and can be used for heavy duty trucks, which other scanner types may not be able to handle. So, What Kind of Scanner Do I Get? As stated earlier, the kind of scanner you get is a function of what you want to do with it and how much cash you’re willing to part with. If all you just care about is finding out what your MIL is saying, without caring about the recommended fixes or other advanced stuff, then all you need is a basic code reader. If you’re the more inquisitive type and you have a budget that is more accommodating, then you can go for the DIY scanner. That way, you get to read the DTCs, what it means and the recommended fixes you should apply. This can really make your car diagnosis fun, as you get to know exactly what is wrong with your vehicle, even if you’ll eventually take it to the mechanic. If you’re a pro and you run a repair clinic for heavy duty trucks, then you may want to get the professional scanners. They offer more precision and value that will aid your overall work efficiency. How Do I Find the Best Scanner? A good purchase decision must always be preceded by research. The best way to know what scanner suits you the most is by reading the reviews of available scanners online. 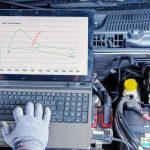 Admittedly this can be a cumbersome process if you’re trying to do it on your own – this is why we’ve compiled the list of the top 5 OBD scanners — as far as 2017 is concerned. And yeah… you’re welcome! The OBD scan tool can be a nice and all, but selecting the right one for your vehicle can be a tad more complicated, if you had no help. But lucky for you, we’re here to provide just the help you need. 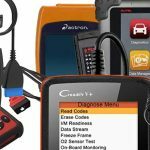 So here are the top 5 OBD2 Scanners of 2017. When it comes to basic, straightforward scanners… this is as good as it gets. 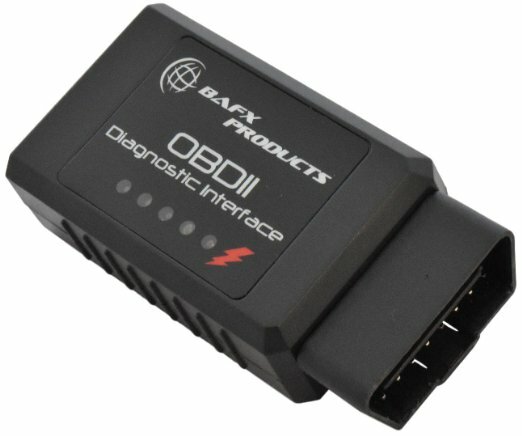 With nothing fancy in its design, the BAFX 34T5 OBD2 scanner is built for reliability and efficiency in interpreting the relevant diagnostic codes, which it supplies to its third-party android application via Bluetooth. This device can also transmit information to personal computers (PC), but only those running on Microsoft Windows. Once you connect this scan tool to your PC (via cable), the rest is quite simple and straightforward, once you consult the users’ manual. It even comes with a demo option for PC. For android use, you’ll need to first download the relevant app to your smartphone, before you can receive and work with the data generated by the scanner. This scan tool is actually pretty amazing. It is portable, allowing for easy carriage up and down. It is also very compatible with a wide range of vehicles, making it more universally relevant. It also supplies some pretty cool stats like RPM, acceleration stats, balance rates, engine temperature and others. To top it all, it is very affordable (and comes with a 1-year warranty), making it a “kickass” choice, compared to the more expensive scan tools. It is not compatible with Mac or IOS devices. The Autel Al519 Enhanced OBD2 Scan Tool is one beautiful piece of tech. With the touch of a button, you can have access to your vehicle’s drive cycle and emission readiness. This handheld scanner also has the capacity to store information which can easily be accessed at a later time. It is also quite versatile as it can conveniently handle all the 10 forms of OBD2 codes, even those that are manufacturer-specific. It can also be used to easily retrieve your Vehicle Identification Number (VIN). One notable shortcoming of this device is the fact that it needs to be manually connected to a Windows PC, before you can get the interpretations of the displayed codes, as well as the recommended fixes to be applied. Also, the protective casing is made of flexible plastic which is not very durable. Vehicle’s emission readiness can be discovered just by the push of a button. It can easily retrieve the VIN. Must be connected to Windows PC for full functionality. Protective casing is not durable. This device is also another great piece of tech from Innova. 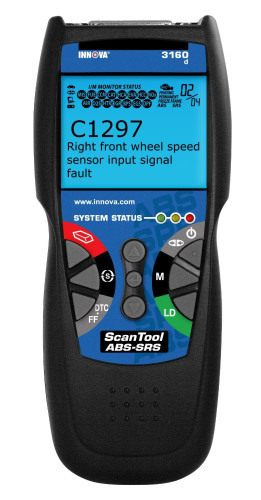 The Innova 3160 diagnostic scan tool also comes with ABS/SRS and live data for vehicles running on OBD2. The simple but cool led-lit screen, can display around 25 different pieces of car info simultaneously. 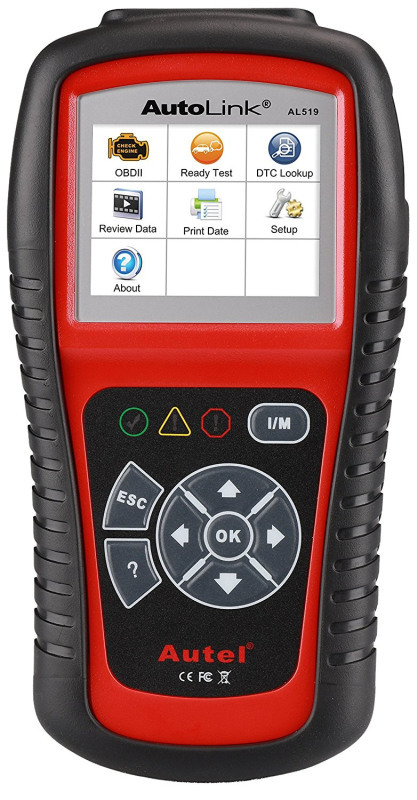 One rather great feature of this scan tool is that it doesn’t just display the error codes, it also provides full-text info on those codes, which is displayed on the hand-held device. Though it is worthy of note that some error codes on display still lack satisfying explanation, so you may occasionally need to check out such information online. The Innova 3160 is compatible with both OBD 1 and OBD 2 vehicles, making it more useful for a wider range of vehicles. Another cool feature is the fact that the screen options come with a trilingual flexibility, making it very much usable outside the US. Also, the handheld component can be easily updated just by connecting it to a PC running Windows. It contains the SRS and ABS of Toyota and Honda vehicles. Needs connection to a PC with USB port for full functionality. Some error codes still need to be checked out online for clear interpretation. When it comes to the production of OBD scan tools, the Actron group needs no serious introduction. This group is rather renowned for the superior quality that accompanies their product. And as far as Actron CP9570 Enhanced Auto Scanner Plus is concerned, they have not failed to deliver! The live data feed that is featured by this device provides an excellent means of accessing data codes on time and up-to-the-minute – this in itself is a major boost, when it comes to applying fixes. The scan data can also be played back and stored at will. Providing access to the vehicle’s performance history. 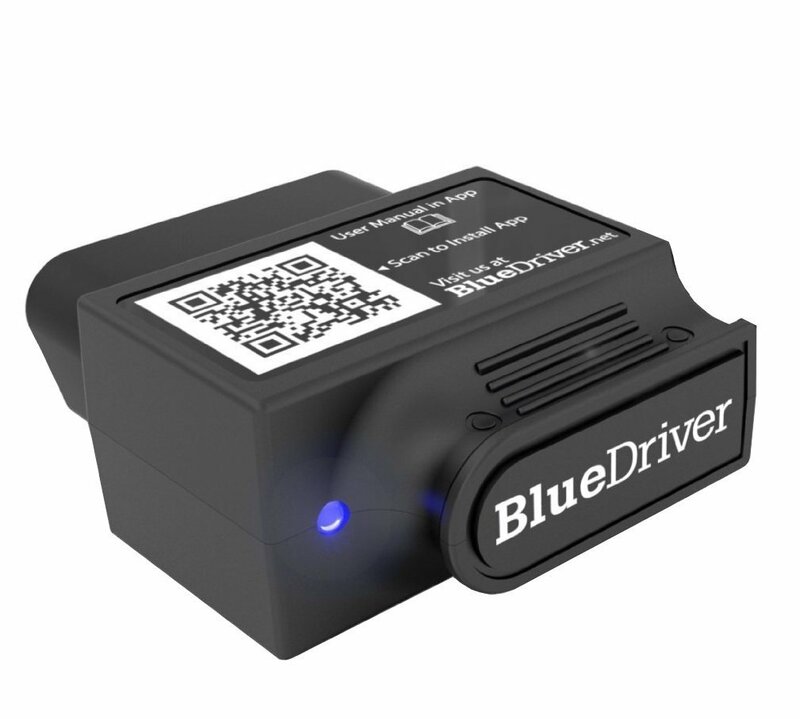 This awesome device also comes with a “code connect” feature, that precisely locates the specific areas in the vehicle where the fault actually is, as well as the required fixes to be applied. This plays no small role in simplifying the repair process. It is also worthy of note that this device is very light (less than 1 pound), making it easy to move around. 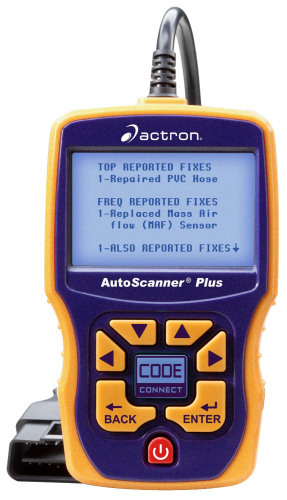 The Actron CP9570 Enhanced Auto Scanner Plus, comes with several dry-cell, in-built batteries, which makes it totally independent of the engine power. Also, it is compatible with OBD 1 and OBD2, making it usable by a wide range of vehicles. The only notable short coming of this device is that it shows non-compatibility with certain operating systems, which makes it undetectable to PCs running on that OS. The presence of batteries makes it more reliable. Shows non-compatibility with some vehicles’ firmware. Without a doubt, this is truly a beautifully amazing piece of tech. Its versatility is second to none, as it showcases a flawless compatibility with both android and iOS devices. The iOS and android applications of this scan tool (which is totally free, by the way), boasts a mind-blowing database, containing over 4.3 million available fixes for every possible make and model of vehicle (made after 1996, of course). In a nutshell, it’s compatibility is universal and can be used for all vehicles. This scan tool is very handy and synchronizes with your smartphone, which interprets the data being received from the scanner. It is also notable that all data received from previous scans can be easily saved, making future reference immensely easy. This device also does a great job of giving explanations to common issues, that pop up from time to time. Some of its recommended fixes usually require deep technical knowledge to apply. In thought, the idea of setting up your OBD2 scan tool may seem rather easy, but in practice, you may find that things aren’t quite as straightforward as commonly advertised – it’s easier said than done! Having said that, setting up your scan tool is equally not rocket science and can be easily done – with a little guide! Generally, all OBD2 scan tools come with a user’s manual. Although the information in the manual may differ significantly from brand to brand, the general procedure for setting up the device will be spelt out in the manuals. However, some basic precautions will come in handy in the setup of your scanner. Using protective clothing: On a general level, all garage-related activities require the use of protecting clothing. These may be in the form of gloves, goggles or overcoat, that protect the user from possible environmental hazards. Be alert: When setting up your OBD scan tool, you must be alert and aware. It is important to read the user manual meticulously to ensure that you maintain the right position during the setup. As with other electrical-oriented appliance setup, there’s always the risk of fire outbreaks and electrical surges, if proper care is not taken. So, you must take appropriate precaution to avoid getting injured. Use the right tools: It’s important to use the right set of tools when setting up your OBD scanner. This is particularly important in order to ensure safety from electrical surges or shocks, since the instalment area is usually electrically charged. Use the right location: Ideally, the setup of the OBD scanner (like any other car related installments,) should be done in the garage. But nowadays, more and more people have adopted the DIY approach and so, they perform car operations just about anywhere. However, for safety, ensure that your installation location is open and ventilated enough to get help in the event of an emergency. With knowledge of these safety precautions, you can then go on to set up your scan tool. As pointed out earlier, the setup process is not uniform for the different scanner types. However, some things just don’t change! Some of the basic steps are discussed below. Download of the required app: Applications are the lifeblood of “wide-usage” devices. These applications are like the heart of the devices, that keep them ticking and useful. Some OBD scanners come with their required application which can just be easily installed on the PC or smartphone. But for some others, you’ll need to download the apps from online stores – either for free or by purchase. The required apps must first be installed on the target device (PC or smartphone), before you even commence the OBD scanner setup process. 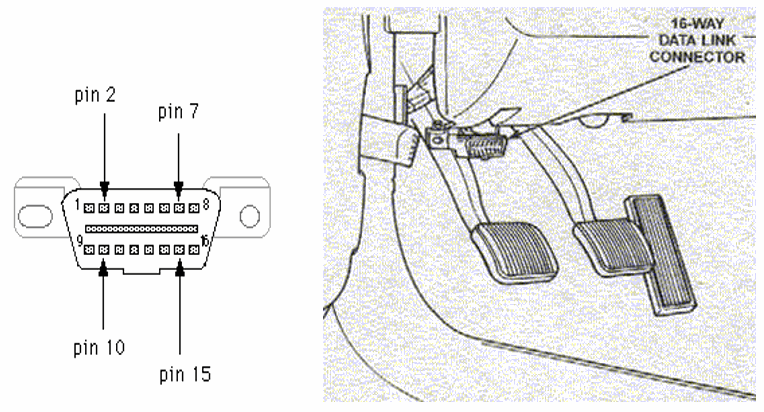 Utilize your Data Link Connector (DLC): The 16-pin connector (also known as DLC), is your “visa” that grants you access into your car’s engine via your Scanner. Without the DLC, you can as well forget about using the OBD2 scanner. The DLC is marked with different colours, which represent different destinations of the wiring. The DLC is usually placed underneath the dashboard (on either sides) or under the driver’s seat (in older cars). Connecting the OBD Scanner: Once the OBD2 scanner is connected to the DLC, try to power on the device. 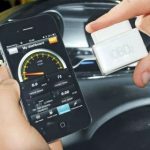 Usually, most OBD scanners have their own independent power source (batteries), but some may still need to use the engine power at some point. Once you power it on, the display light should turn on and the keypads should be useable for the navigation of the icons. If this is not the case, then your connection is not successful and you should check it again. Run your first scan: Since the whole point of spending your hard-earned cash on a scanner is to scan your car, then you might as well just do it, right? Running your first scan will finally confirm to you whether your scanner is functional. For instance, if your car is giving you the “check engine” light and after scanning, your scanner reports no problem with the car, then you can be sure there’s something wrong with that scanner. So, you may want to dash back to the retail store for a replacement. You can check out the video below for more info on OBD2 scanner setup. For the regular coffee shop guy, the technical jargons involved in the usage of OBD scanners may not really be worth reading about. But then, you never know how and when the knowledge of these little stuff will come in handy – so, might be worth taking a look at. You can see the ECU as the “brain” of the vehicle. It can either be used to describe a single module or collection of different modules. The ECU controls and monitors a lot of the car functions. It may be manufacturer-standardized or can be reprogrammable. Engine Control Module (ECM): Controls air-to-fuel ratio, ignition timing etc. Powertrain Control Module (PCM): Controls the power train. 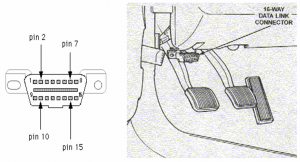 Body Control Module (BCM): Controls power seats, power windows, etc. What is OBD and what are its advantages? 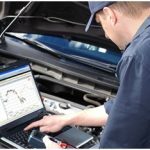 Why do we need an OBD scan tool? Does my vehicle have OBD-II? What do I do when the warning light comes on? Does the warning light only mean the emissions controls on my car aren’t working? What will the technician do when I take my vehicle into the shop? Why can a vehicle pass a tailpipe test but fail an OBD test? OBD is an acronym that means “on-board diagnostics”. It’s a self-diagnostic system that was mandated by the US government, to be built into all vehicles from 1996 upwards. This was enforced in the environmental protection act (EPA). This system was invented as a means of dealing with environmental pollution. It focuses on monitoring all the critical parts of the vehicle’s engine, to ensure zero emissions at all times, thus keeping the environment safe and healthy. The OBD is quite advantageous in that it offers a preemptive warning to the car user (through the Malfunction Indicator Light), thus helping to nib the problem in the bud, before it becomes a major issue that will eventually affect the environment and even the user. Click here for more info on OBD. Why do we need an OBD2 scantool? Think of the OBD2 scantool as the “interpreter” that understands the language of the OBD and translates the information into what we can easily understand. So, in essence the scan tool helps to actually pin-point the exact type and location of the problem your vehicle is experiencing that made it trigger the “check engine” light. The OBD scan tool helps to prevent accidents, since it helps in warning the user of any performance issues the vehicle is experiencing at that point it time. So, by extension, it also helps in saving cost of repairs that the vehicles will require. How do I know if my vehicle has OBD-II? Whether or not your vehicle has OBD II depends on a range of factors like where you live (country) and how old your car is. Generally, all vehicles (made from 1996 upwards) in the US are mandated (by law) to have OBD II, as covered by the EPA. So, if you reside in the US and your vehicle was made after 1996, then your vehicle definitely has OBD II. What is the difference between OBD I and OBD II? OBD 1 is the first generation of the on-board diagnostics system that was enforced by the US government to be installed into every vehicle (by the manufacturers), in order to monitor the vehicle’s emission control components. Though the enforcement was implemented starting from the 1988 model year, it wasn’t very effective, because the system was calibrated to monitor only a small fraction of the emission-associated components. This shortcoming (and a few other flaws), necessitated the need for OBD 2, which was designed to fix the observed flaws. The OBD II is the second generation of the on-board diagnostics system. Being an improvement on the previous version, the OBD II was wider in its scope and coverage of the engine’s components. So, in essence, the OBD II is more effective than OBD I, in its functioning. The OBD II was mandated for all US vehicle manufacturers, since 1996. The “check engine” light is also known as the Malfunction Indicator Light. It is the means through which the OBD scanner sends a warning message to the vehicle user, when maintenance is needed for certain engine components. The “check engine” light is a general indicator that pops up whenever the vehicle’s engine has issue. However, it is not indicative of the extent of the problem. In essence, the problem may be a minor issue that can be easily fixed, through a few “twitches” or it could be a major issue that is big enough to ground the vehicle completely. So, the “check engine” light simply informs the user that a certain level of maintenance is needed for the vehicle. The warning light is a precautionary light displayed on the dashboard when the engine is in need of maintenance or servicing. The warning light can be displayed as “check engine”, “service engine soon” or “maintenance required”. The aim of this warning light is to bring to the awareness of the driver, that some components of the vehicle may soon start malfunctioning if nothing is done about it. When your warning light comes on, the action you take depends on the extent of servicing your vehicle requires and of course, your level of technical knowledge. Generally, when you see this warning light, it’s best you take a trip to your mechanic and have him take a look. However, if you feel you have enough technical knowledge and you don’t want to waste money on the mechanic, all you need to do is get your OBD scan tool to diagnose where the problem is and provide the required servicing. Well, not exactly. Generally, vehicle manufacturers design their cars to be optimal in performance and that includes emission control. So, when there’s a dip in the vehicle’s performance, it may ultimately lead to increased emission from the vehicle, so the warning light comes on. However, the OBD also monitors other systems like the fuel systems, which are normally designed to economize fuel, but when such systems are getting compromised, the vehicle will be running in a less-than-optimal condition. Even if this has no immediate implication on emission risk, the warning light will still come on, to bring the driver’s attention to the fact that such systems are failing – thereby ensuring that the vehicle is always running in an optimal condition at all times. The working efficiency of the OBD scanner generally depends on the general health of your vehicle at that point in time. If your OBD system is working correctly, then your scan tool will provide accurate data. To be sure though, connect your scan tool to your vehicle and press the scan button. 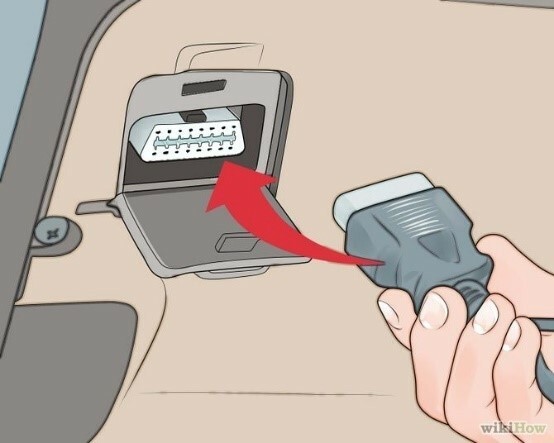 Once you do this and turn on your ignition, there should be a brief flash of the malfunction indicator light (“check engine” etc.,) this is to assure you that the OBD is set to check out your vehicle’s systems for malfunctions. After the brief flash, the light should totally go off. It will only come back on when there’s an issue in the vehicle you need to attend to. What is the implication when the light is blinking? When your malfunction indicator light (MIL) is blinking, just think of it as a ticking time bomb! The MIL begins to blink when there’s a potentially lethal damage to some of the engine’s systems. Such damages, if unattended to, can result in major fatalities or repair costs in the future. When you MIL is blinking, there’s no need to panic, you can still keep driving, but you should avoid speeding. At the earliest convenience, locate a mechanic to run a full scan and fix the problem – or you can as well do it yourself, if you have enough technical know-how. As you would expect – the technician is supposed to fix your vehicle. However, before handing your car to just about any guy who calls himself a technician, be sure to make a few enquiries about his track record and expertise (if you’ve not patronized him before). At the very least, a good technician should have an OBD2 scan tool, which he will use in scanning your vehicle for where the problem is and fix it. However, if you’re in doubt of the technician’s qualification and expertise, it’s always better you take your vehicle elsewhere. You certainly wouldn’t want to embark on return trips, just to fix the same problem over and over. When it comes to vehicle repairs that are emission related, there’s a legal code that forbids certain activities and practices. All manner of repairs may be carried out on the vehicle or even the OBD system, as deemed necessary by the technician, but there must be no tampering. Changing the manufacturer’s original specification or replacing parts with non-certified ones is considered tampering. In the same way, changing (or modifying) the OBD protocols from the original one to non-certified or experimental processes is also considered tampering. Of course, hacking and all other illegal overriding of the vehicle’s system is also considered a serious offence which is punishable by law. What should I do if the light goes off before I take the vehicle to the mechanic? If the MIL goes off before you have the opportunity of seeing a mechanic, then there’s basically no cause for alarm – it simply means that the fault has been resolved, meaning there’s no need for further action. This shouldn’t make you doubt the efficacy or working of your OBD scanner. As a matter of fact, it simply means your scanner is sensitive enough to identify a temporary problem as at when it occurred and also found out when it has been fixed. So, in essence, you don’t need a technician to check out your vehicle anymore, except of course – the light comes back on. The tailpipe test and OBD tests are both methods of identifying vehicles that need repair. However, they’re far from the same. The OBD is more of a preemptive or “early-warning” test, while the tailpipe test is more of an “aftereffect” test. The tailpipe test involves the examination of the composition of a vehicle’s exhaust, to find out whether or not it contains unacceptable emission levels. So, in this case, certain systems have already been considerably compromised to the extent that the emission level is now intolerable. On the other hand, the OBD system monitors the different systems and components of the vehicle, to find out whether or not such components are functioning with optimal efficiency. So, for instance, if there’s a problem with one of the systems, the effect may not be immediately evident, because other supporting systems will start working “extra shifts” to cover up for the lag. So, in this case the vehicle can still pass the tailpipe test (since there’s no emission from the exhaust), but will fail the OBD scan, because OBD will identify the individual faulty systems. The importance of having an OBD II scanner installed in your vehicle cannot be overemphasized. If your desire is for your car to be running at an optimum level of performance, then an OBD2 scan tool is a must-have. Having said that, our goal is simple – to help you make the best purchase decision, as you’re looking to get a car scanner. So, be sure to check back consistently for more and more updates in the world of scanners, so you can be up-to-date at all times.